I never really did figure out what these things were, but they looked pretty neet. They sorta look like some colony of anemones, but basically, that's what coral is, just with a shell. I guess it was a type of coral. We stopped at a cove in the atoll at Lighthouse Reef. 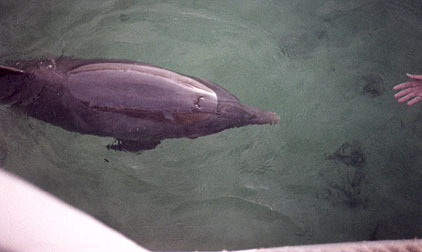 The water was nothing special to attract diving, but this porpoise showed up. The skipper suggested that we go swimming with her. We all went in for a while and she would flash in and out of the poor vis, but she definately seemed most interested in one guy in our group. We all eventually got out, except for him, because the porpoise wanted to play with him. At one point she basically prevented him from getting out. Finally he climbed up too and said that it was quite an experience. The skipper at this point sorta asked if there had been any problem getting out. The guy said 'no, not really, she just seemed really friendly and wanted to play'. The skipper, not too loudly, said 'good, she wouldn't let a woman out of the water 2 weeks ago and broke a few of her ribs'. Great. Makes you feel like a sardine. 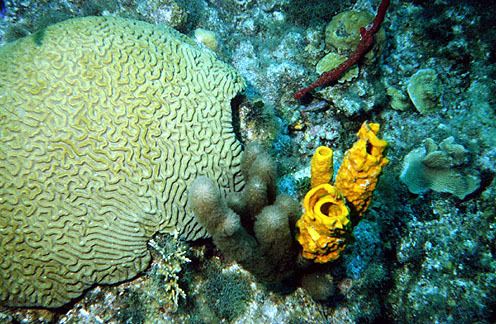 Nice pic of a brain coral and some sponges. It's amazing how the reef just goes on and on, always the same, always different. Look close or look far and it is a feast for the eyes. There are lots of fish and the big groupers are common as well. 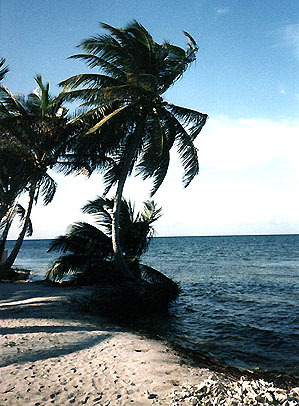 Karen and I were moving from outside the reef towards the lagoon on the inside of the atoll. 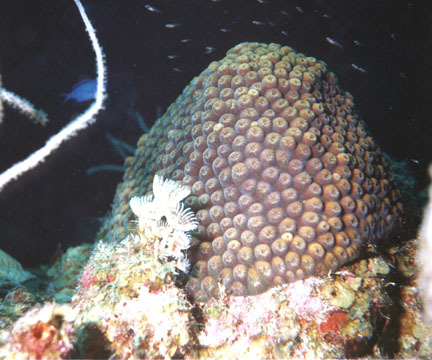 The reef has seawater circulation patterns. It breathes and like lungs, the passages get smaller as they go on. Well, Karen headed into the passages as they got smaller and smaller on the inside of the reef. I followed along, not too concerned, because while it was like a cave there was plenty of light and I figured I could get out the opening at the top of the chambers we were travelling through. It started to get smaller though and the chambers were soon going to be too small for me. The exits were shrinking faster though. About the time she went into the next smaller chamber, I didn't like it. If I followed her, there wasn't going to be any room for the two of us. About that time, she decided to exit out the top. Fine with me, but it was a tight squeeze for me, even being a bit further out. I don't think that I would have gone very far in without someone leading... Interesting. I think that qualifies as one of the most unique dives a person could get to do. 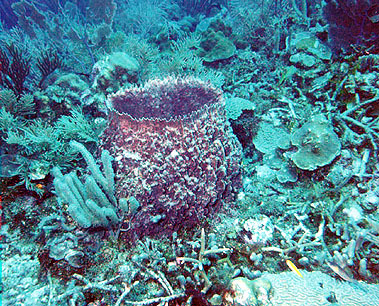 This was another specimen of the common large red sponges. When smaller, they have a far more interesting color than their huge siblings. It was funny. After the dive, the boat was parked over the reef in shallow water. It was less than 30 feet deep and the skipper suggested free diving. I'm always up for that, so I went in with a couple of the other divers. We'll, I free dive pretty good, so I worked out just a little ways to where the reef started to drop off. In the watrm clear water, it was easy to dive to 60 feet or so. I did a few dives and noticed that the skipper was quite excitedly signalling me and talking about the bends. Gee wiz. I wasn't really at hazard, but I'm ... usually nice to the skipper. I was just having fun. On Lighthouse Reef is an old light tower. It is rusted out and treacherous, but I had to climb it. In the U.S., it would have been destroyed as a nuisence long ago, but here it was just an aged piece of forgotten rust. The view was beautiful. It was the end of the last day and we were going to head back. I wanted to drink in whatever memories I could take with me. I usually travel alone, but especially so here, with only my thoughts. I climbed down and walked along a beach under the palm trees. At a time like this you don't want to go back, but this was the end of the beach and the end of a fantastic trip. Always, see the beauty of the world and remember. I hope you were able to take the trip with me and enjoyed it.